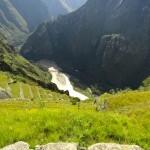 Machu Picchu is perhaps the best-known tourist destination in Peru. A UNESCO World Heritage Site since 1983 and named one of the Seven Wonders of the World in 2007, Machu Picchu hosts approximately 2,500 visitors a day. That’s about 300,000 people tramping around the sacred site each year. Last month, I was one of them. There are many ways to get to Machu Picchu. Most of them start in Cuzco, the ancient Incan capital. A place that brings together Incan and Spanish architecture with high end shops for tourists dominating the Historic Square. 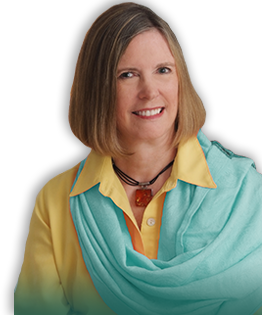 The Spanish built their cathedral in 1560 on the site of The Inca Viracocha’s palace. Spanish baroque architecture rises on perfectly matched Incan rock foundations. The Jesuit Church of the Company, built in 1571, stands nearby. 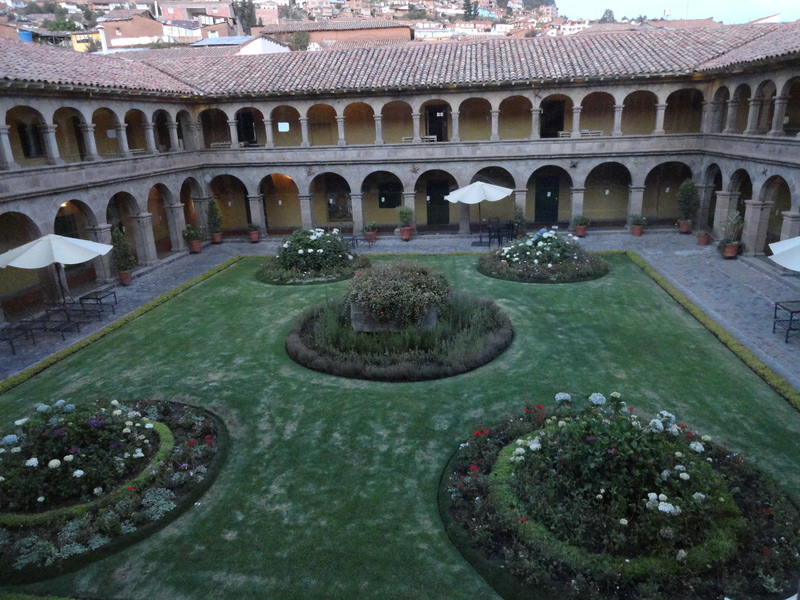 Sadly, I didn’t have enough time to explore Cuzco, though I did soak up some Spanish colonial flavor at the Belmond Hotel Monasterio. Originally built in 1592, the structure’s foundation is the Inca Amaru Qhala’s Palace. The Spanish used the site for a seminary. In 1965, the cloistered monastery became a hotel housing pilgrims of a different kind. 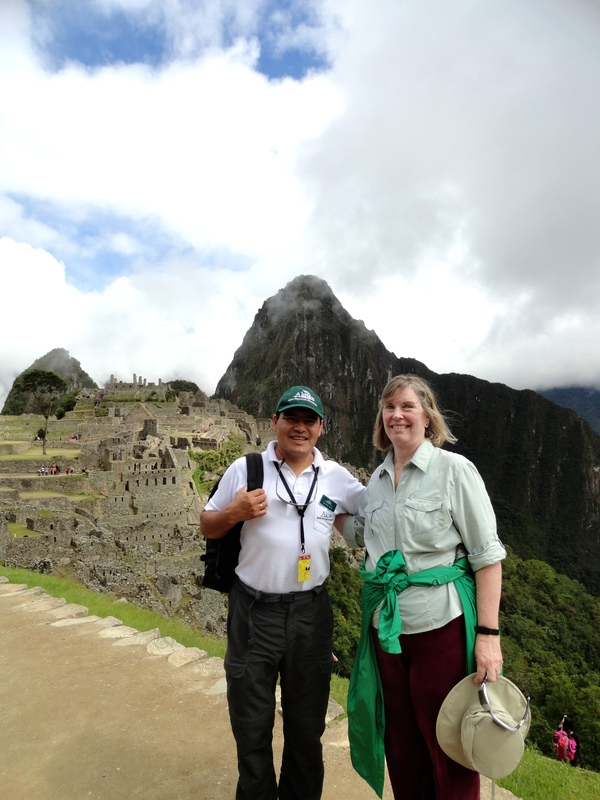 At Cusco, we met our guide Jose Angel Ayerbe and with our driver set off for Urubamba. 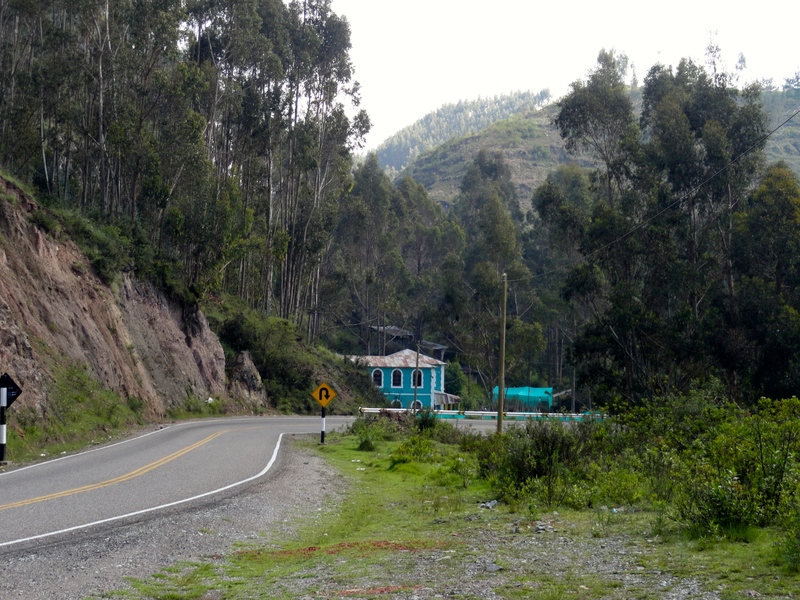 The road is, to say the least, bumpy and winding. The views are amazing and make the queasy journey rewarding. When we stopped for a few minutes, the stillness and quiet were almost otherworldly. 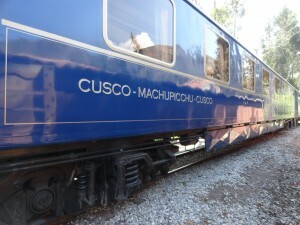 The train is outfitted as part of the tourist travel experience. There are two dining cars and a bar/observation car. Lunch is served on white table clothes. Too bad I didn’t bring my tiara. 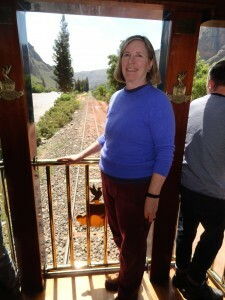 Standing at the back of the Observation Car. 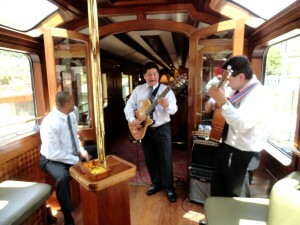 A trio of talented musicians provided a selection of tunes ranging from traditional Peruvian melodies to Beatles. Something for everyone. Musicians aboard the Hiram Bingham Train. Percussion is not played on drums but on a box. This unusual instrument is a legacy from slavery when the workers were not allowed to have any musical instruments, so they improvised, and the “Box” is still in use today. A three and a half hour journey on narrow gauge track brought us to the train station at Aguas Calientes, the closest access point to Machu Picchu. The village boasts over one hundred hotels, souvenier shops, a local souveneir market, and restaurants. From here, visitors can walk one and a half hours to the summit or take the bus. 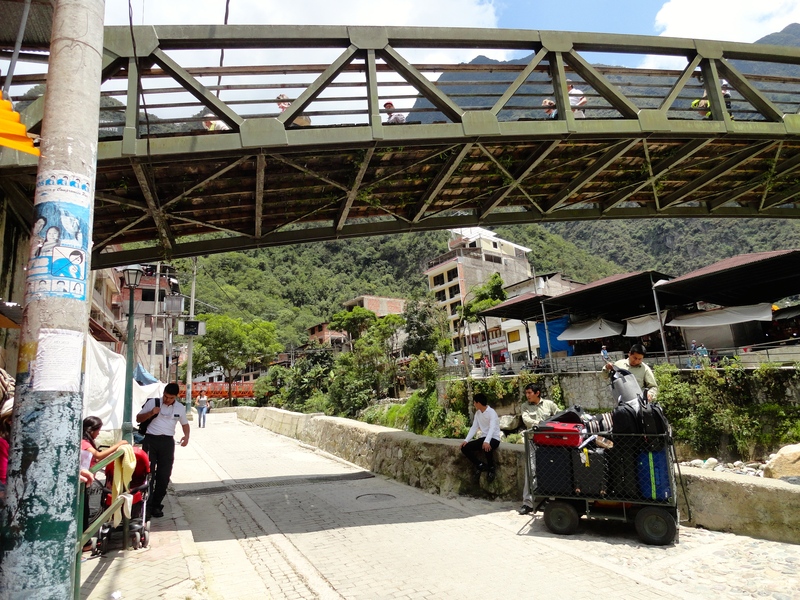 Bridge from upper to lower Aguas Calientes. The bus is at a lower level than the train station and requires a stroll through the indigenous market. The road to the summit is basically one and a half lanes wide, which makes it interesting when the busses need to pass each other. No guard rails, but excellent views. Signage: Machu Picchu Sanctuary Lodge. 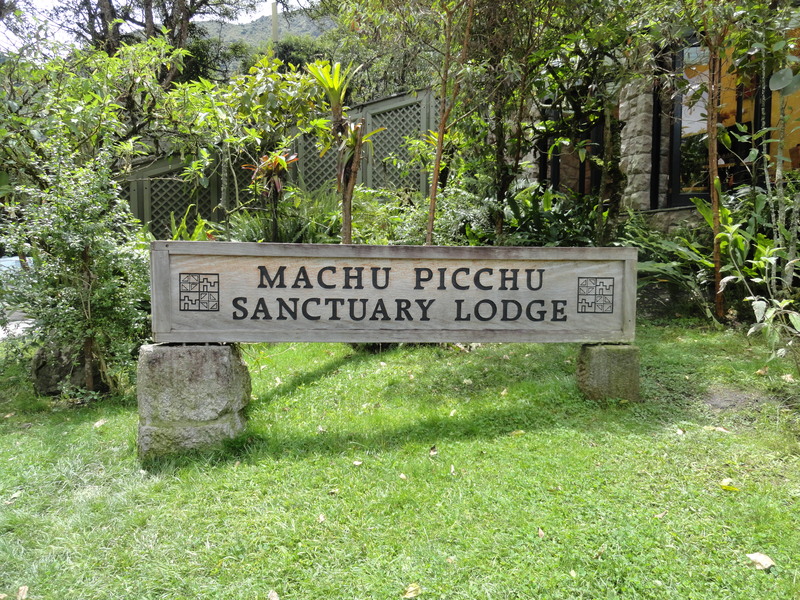 We arrived at Machu Picchu in time for lunch at the Belmond Sanctuary Lodge, a thirty room hotel a five minute walk from the entrance to Machu Picchu. It was a bucket list moment. 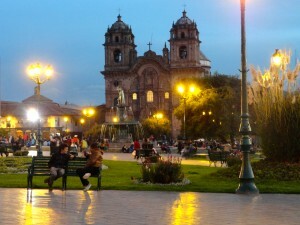 Historical Center of Cusco City. Here. Society of International Railway Travelers. Hiram Bingham. Here. 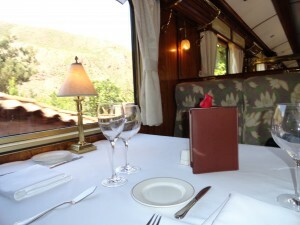 Belmond Hiram Bingham Luxury Train Here. 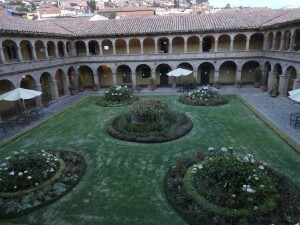 Belmond Hotel Monasterio, Cuzco. Here. Belmond Sanctuary Lodge, Machu Picchu. Here. Thank you for the compliments on my photos. I hope to keep improving. Visiting Machu Picchu remains a travel highlight for me. Thanks for getting in touch.